I discovered the Sufferfest somewhere during the 2011 – 2012 season and it has been my preferred platform for a long time. In December of 2013, I became the first Dutch ‘Knight of Sufferlandria’ (Kos) – a report of that ‘happening’ can be read here. Unfortunately, as mentioned above, I eventually went into exile voluntarily, because I felt that the original Sufferlandrian and the ‘knighthood’ values were going down the drain because of commercial aspirations. Undoubtedly an understandable development, because it’s not without reason that I do not earn a dime with most of what I do or develop, and that is obviously not a healthy ‘business model’. So, despite my leaving Sufferlandria, the Sufferfest has developed over the years into a solid party in the online trainer world. You can now also do interactive workouts with your smart trainer and they offer a wide range of other workouts, such as yoga, strength (core) and mental training. I cannot tell you anything more about that, because I do not intend to return to Sufferlandria anytime soon. Nevertheless, I wholeheartedly invite you to go and discover the Sufferlandrian realm yourself. The costs are $ 12.99 per month or $ 99 per year – if you only use the Sufferfest for about 6 months per year, then a monthly subscription would be your best / cheapest choice. Speaking of solid, Zwift now probably has the largest user base on the planet. I used Zwift for a while – from its beta days until late 2016 – but I eventually cancelled my membership, as I had grown weary of the cartoon interface. No matter the quality, it’s still a cartoon and it cannot hold a candle to the quality of a real life (video) recording, especially when that is Tacx / VeloReality quality*. Moreover, a very generous algorithm is used to calculate your virtual speed – with relatively little effort, ie. Watts, you should be able to average 40 kph on the flat courses. Anyway, Zwift has expanded the number of virtual courses, including pro world championship courses and they have even added their own version of the Alpe d’Huez, aptly dubbed Alpe du Zwift. Zwift is also the platform with the largest number of (social) group rides and online races and you can regularly ride with a real professional. There are also virtual jerseys to try and wear for a few seconds, if you can sprint or climb that is. And besides all that, you can actually run in the Zwift realms. You’ll need a compatible foot pod with a normal treadmill, or a Bluetooth enabled treadmill. Zwift offers their own ZwiftPod, so if you have a treadmill – and frequently run, besides bike – you may get one of those, to enhance your Zwift experience. The costs for Zwifting are a lot higher than back in the day, but $ 14.99 per month is still a good deal, considering what you get. *The quality of Rouvy’s ‘premium’ video content is mediocre at best, compared to Tacx / VeloReality. You can read (a lot) more about my love-hate relationship with Rouvy in various other posts, so I’m not going into that here. Don’t let my being done with them stop you from giving it a try, because at $ 6.25 per month, you will not get anything better, anywhere else. If you are more than one and/or cannot do without their ‘premium’ content*, you’ll need the family subscription, but at $10 per month, that is still the best bargain you’ll find. Besides developments mentioned in my original/revised and other separate posts, Rouvy decided that this season would be dedicated to their introduction of augmented reality. 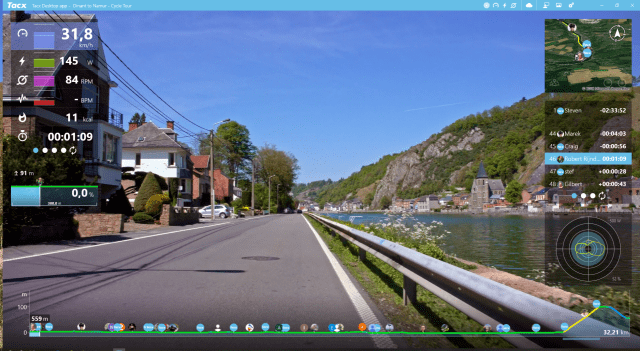 It’s probably best if you just read Ray Maker’s post on it – for me, it’s nothing but adding an overlay with Zwift-like cartoon characters in an otherwise nicely (shot) real life video. You may love it though, even if the original quality of the video footage suffers at it and the characters move as awkward as they do in Zwift, probably even worse. I don’t, but as I have divorced Rouvy anyway, I do not need to. *You will need access to that anyway, if you decide you want to make serious work of your career, or participate in some challenges that require finishing premium routes. At the time I got Tacx TTS (Tacx Trainer Software – for Mac / Windows) with my Genius and therefore I did not purchase it separately and to be honest, I do not think I would have. However, as of early December (2018) TTS is no longer available for purchase, so you will have to use their new platform, which runs on your desktop (Mac / Windows), smartphone and tablet. For € 9.99 per month or € 99.99 * per year you have access to all content, but ‘real life films’ can only be played via the desktop (Windows / Mac) app. Personally, I find it odd that only Bluetooth 4+ connections are supported, because I have a good Ant+ USB stick, notably from Tacx, but so be it. In my experience, Bluetooth connections are not that easily established and/or maintained when using a Windows based PC, but that may well be a problem similar to before, where the standard advise was to not use the native adapter. I’ll investigate this further, as I still have a Bluetooth dongle, but that may well be obsolete, as it is quite old. Anyway, if you also want to be able to stream in full HD quality, you need the more expensive HD Premium subscription, for € 13.99 per month or € 139.99 per year respectively. Because of the high quality of the video footage, I think Tacx is worth it, but it doesn’t come cheap. If you are really only/mainly interested in the highest possible quality video footage for your interactive training, then VeloReality is your best choice. Their collection has a huge overlap with Tacx, as they are from the same producer, but they also have a score of videos shot in North-America and Canada that Tacx does not offer at all. VeloReality has the same pricing model as Tacx with TTS, i.e. videos typically cost around $ 12 each. However, they offer a large number of ‘grand tours’ and regular promotions with nice discounts, so on average you would actually not have to spend much more than $ 7.50 per video, probably less. But, unlike Tacx, VeloReality offers the software to hook up your trainer and and register / export your ride, for free. It is definitely not the most advanced software / interface you see in most other programs these days, but it does the job. You can also ride online with / against others, or against yourself, if you have already done a ride before. VeloReality is the best alternative for Tacx TTS when it comes to pure video quality. I have mentioned a few in my original post, like RGT (Road Grand Tours), Bkool and Kinomap, but other than RGT – which, at present, is still beta – I have not really investigated any of them seriously. Kinomap is a no-go for me, as that only features on-bike video footage and for some reason, I really do not like that at all. 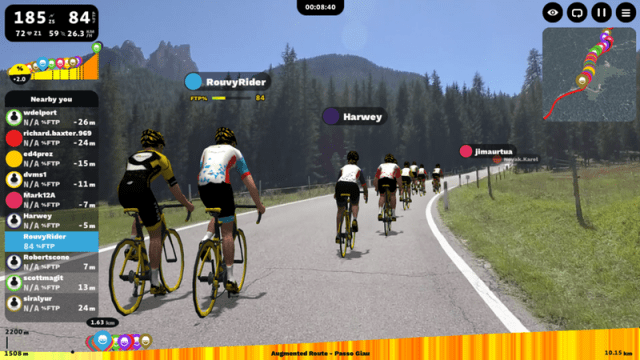 Bkool looks like the perfect mix between Zwift and Tacx, but so does Rouvy. Unfortunately, I think there is no perfect mix. I can’t speak on behalf of the Bkoolers out there, but I have seen the stuff Rouviers have been asking for, like adding the draft functionality that can be found on Zwift (and Tacx these days). As always, comment or share your experience with these or any other platform you work with below. Shortly after I posted this review, Gary from VeloReality emailed me, about the overlap with Tacx videos. As it turns out, he did work with the same producer for a couple of years, but when VeloReality decided to switch to filming in 4K, that cooperation stopped. In total, there are about 60 films that are also sold by Tacx, but VeloReality currently has some 300 in their library.